We are pleased to share the latest news on financial education in this fourth e-newsletter of the CCFL. Peter Nares, SEDI founder and executive director, and Tim Hockey, TD Canada Trust president and CEO, at the announcement. 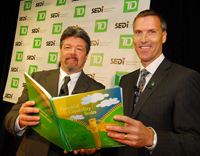 TD and Social and Enterprise Development Innovations (SEDI) announced on January 26, 2010, in Toronto, that TD would provide $14.5 million in funding to SEDI. Funds went to the CCFL and the new TD Financial Literacy Grant Fund, helping hundreds of thousands of Canadians to benefit from financial literacy programs. The funding is making it possible for SEDI to accelerate the work of the CCFL and manage the new TD Financial Literacy Grant Fund, reaching out to more organizations serving low-income people across Canada. Over 230,000 low-income people will benefit from the CCFL programs alone in its first five years of operation. The grant fund will provide grants to qualified community organizations to help integrate financial literacy training into their services. SEDI is currently developing the grant disbursal system and aims to distribute applications in the spring of 2010. Please visit www.sedi.org/grantfund in the spring for more information on eligibility, how to apply and deadlines. The federal Task Force on Financial Literacy is inviting all Canadians to participate in an unprecedented cross-country consultation on financial literacy. The task force will meet with Canadians in 15 cities and host an interactive online forum to hear what they have to say about financial matters such as managing debt, saving and investing, retirement planning and preventing fraud. Your participation in the consultations is very important as it will help the task force to develop and provide recommendations, by the end of 2010, to the federal Minister of Finance on a national strategy to strengthen Canadians’ financial literacy. SEDI and the CCFL are encouraging community organizations to make their voices heard and help ensure that the recommendations reflect the values and priorities of our sector. SEDI would like to see the task force’s final report address issues facing low-income earners in Canada. SEDI's submission to the task force will be posted on the SEDI and CCFL websites in April and the organization will present highlights from the submission at the task force’s public session in Toronto on May 11, 2010. The creation of this independent, multisectoral Task Force on Financial Literacy was recommended by SEDI to the federal government in 2008. The task force was appointed in June 2009. SEDI is a strategic advisor to the group. 3. Participate in the online forum. For a listing of the dates and locations of the public sessions, click here. Consultations will end on May 13, 2010. 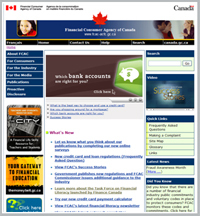 The Financial Consumer Agency of Canada (FCAC) released the study Is Financial Education in Canada Working? Research and Recommended Best Practices for Evaluating Financial Education Programs. The paper, prepared by Caroline Cakebread, is available on the FCAC’s website. The CCFL is seeking community organizations serving Aboriginal Peoples, newcomers to Canada, youth, women, and families with children in Northern Ontario to be partners in a program called Financial Literacy for Ontarians and funded by The Ontario Trillium Foundation. The goal is to train over 75 community organizations, with an emphasis in rural and remote communities. Facilitators trained through this program will provide financial education to over 2,000 Ontarians. The program began in November 2009 and will end in 2012. For more on how to become a community partner in the program, please contact Adam Fair at afair@theccfl.ca. The CCFL and the Financial Consumer Agency of Canada (FCAC) have partnered to deliver FCAC’s life skills resource The City at community organizations serving youth across Canada. The CCFL has trained staff facilitators on The City curriculum at five organizations, including the Employment & Education Centre in Brockville, ON; Carrefour Jeunesse Emploi de Côte-des-Neiges in Montreal, QC; Black Business Initiative in Halifax, NS; North Clay Belt CFDC in Kapuskasing, ON; and Youth Opportunities Unlimited in London, ON. These partner organizations invited staff from other youth serving groups in their area to attend the facilitator training session. Trained staff have begun delivering The City’s financial literacy curriculum to youth in five communities across Canada. Over the next year, more than 1,000 youth will participate in The City’s financial literacy workshops and provide feedback to the CCFL and the FCAC on the usability of this resource at community organizations. Starting in May 2010, the CCFL will deliver training sessions to five additional youth serving organizations, including two organizations targeting Aboriginal youth. If your organization is interested in participating in this program as a local partner, please contact Shari Grayson at sgrayson@theccfl.ca. YWCA’s Nicole Rosenow-Redhead conducts a financial literacy workshop at the Halifax Refugee Clinic. Understanding how financial services and products work in Canada is a challenge many newcomers face. The YWCA Halifax is helping newcomers overcome this barrier by offering money management workshops as part of the CCFL’s Financial Literacy for Newcomers program, funded by Citizenship and Immigration Canada. “Many newcomers have little information on income tax and the importance of credit ratings because these two areas are often handled differently in other countries. There is so much to learn when in a new country,” says Nicole Rosenow-Redhead, the program facilitator at the YWCA. “The financial literacy workshops are helping our clients gain the confidence to ask questions and seek information about money matters and hence build a secure financial future in Canada.” Besides the YWCA Halifax, two other organizations are participating in the program, WoodGreen Community Services in Toronto, and S.U.C.CE.S.S. in Vancouver. 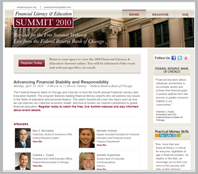 The Federal Reserve Bank of Chicago and Visa will co-host the fourth annual Financial Literacy and Education Summit themed Advancing Financial Stability and Responsibility. Live webcast of the event will feature financial literacy experts who will address key issues in the fields of education and personal finance, including Michelle Greene, who leads the financial literacy effort for the Obama Administration at the Treasury Department. There is no cost to view the webcast, but space is limited. To register in advance, visit the event’s website. This year the SEDI Awards will highlight the importance of savings initiatives that help individuals, families and communities move forward economically. The three award categories are: 1) Independent Living Award (for graduates from SEDI’s ILA program); 2) Passion for Financial Literacy Award (for front-line agents); and 3) Success in Self-Employment (for graduates from SEDI’s entrepreneurship programs). Calls for nominations start this spring, when further information on the event and award eligibility will be available at www.sedi.org/sediawards. The SEDI Awards is an opportunity for your organization to highlight remarkable staff members and graduates from SEDI programs. The Jim Casey Youth Opportunities Initiative, a national U.S. foundation, has created an innovative program called Opportunity Passport™ to help youth leaving foster care make successful transitions to adulthood. The Opportunity Passport™ is a component of the foundation’s Increased Opportunities strategy that helps young adults learn to manage money and achieve economic success. The Opportunity Passport™ is a package of resources that includes financial literacy training, a matched savings account, and a personal bank account. Data collected from the participants over the past three years provide strong evidence that the program helps youth leaving foster care learn financial management and save money for assets. Click here for more information on this initiative. 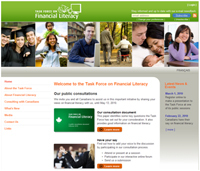 The CCFL website, www.theccfl.ca, was created for program facilitators and others seeking the latest news on financial literacy and opportunities to share ideas and best practices. Connect with others in the field via forums, Twitter and Facebook.